We would like to introduce artists who have participated in Residency on the Farm. We are excited about their art and proud of the hard work they did at the residency. Emmy Bean is a singer, performer and teaching artist living in Chicago. She writes songs and performs with Chris Schoen and T-Roy Martin in 80 Foots, the world's only End Times Vocal Trio. She performs frequently with Opera-Matic in the parks on Chicago's northwest side, and with John Szymanski in the Monthly Music Club. Emmy teaches in Chicago Public Schools with Chicago Arts Partnerships in Education and in children's hospitals with Snow City Arts. Recent performance work includes: The Little Match Girl Passion with Facility Theater, You're His Child, a solo performance, A Memory Palace of Fear with Theater Oobleck, Erica Mott's Trials and Trails at Steelworkers Park, Baudelaire in a Box with Theatre Oobleck, The Carter Family Family Show with the Neo-Futurists. She holds an M.A. in Interdisciplinary Arts from Columbia College Chicago. What did you do at Residency on the Farm? 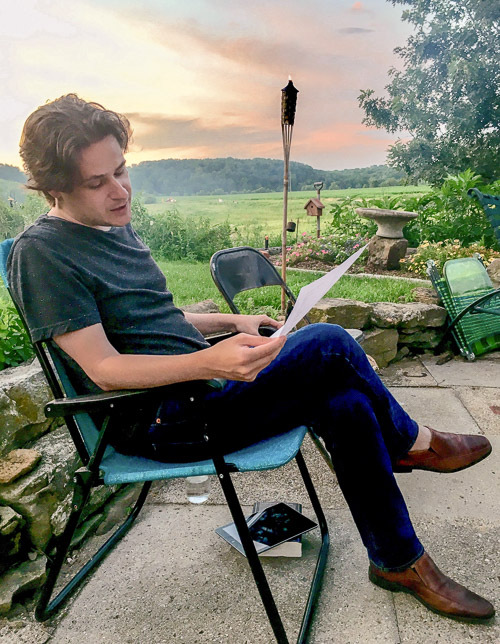 At the farm, I wrote about four or five new songs, and did at least a month's worth of thinking and talking with other artists that moved my work forward in many ways. Both my performance work and my music benefited hugely from the time I spent there, from the space and the quiet and the lovingkindness of Kat and Theresa and our cohort of artists and writers. Colby Gillette is the author of the forthcoming collection Hymn Underground (Spect!) and the chapbooks, Without Repair (Called Back Books) and Red of the Dawnbreakers: Translations of René Char (Spect!). He holds an MFA from Saint Mary's College of California and a Ph.D. from UNLV. He lives and teaches in Pittsburgh. I spent my time at the farm working on a long-form pastoral poem that has roots in a year I spent living and working on a goat farm that grew a variety of fruits. In this way, the residency at the farm was a bit of a deja vu experience, which stimulated my memory and invigorated my writing. The rhythm at the farm, where I spent my afternoons walking in the country and reading in the sunshine and my evenings engaged in conversation, was conducive to my creative process. I spent each morning of the residency writing for four to five hours and fully immersed in the poem. I can't wait to return to the farm to start in on another long-form poem. Gina Goldblatt is a writer, aerialist and dog walker out of Oakland, California by way of suburbia, New York. She is the founder of Liminal, a feminist and womanist writing organization with an emphasis on providing writing workshops and performance opportunities for women and gender non-conforming voices. She is working on her first novel, newly re-named Come On, Be Fun, has a chapbook of intertwined flash fiction pieces out from The Gorilla Press entitled All Small Carcasses, and is planning the second installment of Grounded in Sky, an exclusive event series that combines storytelling and aerial arts for late 2018\early 2019. You can find out more about her work here and here and here and here. Residency on the Farm gave me space and time to think creatively in a beautiful place. The food, people, goats and nature were all refreshing and nourishing for both my emotional/psychological self and my body of work. I was able to revise parts of my novel in progress, as well as write some new parts of it while in Residency on the farm. Matt Hayes is an artist and creative technologist currently in Brooklyn, NY. He is interested in a blending of traditional aesthetic principals and sensibilities with modern processes and technologies. He primarily works in digital media, sculpture, and furniture making. He tries in all his work to bring together a sense of playfulness and gravity. He can be found sprinkled, sparsely but widely, across the internet under the handle 'mysterycommand'. At the farm I worked with concrete. I spent a few days just experimenting with the material and exploring what might be possible. The piece I finished is an oversized representation of a local berry called "Black Cap in Concrete". The giant berry is somewhat nostalgic and silly. It reminds me of being a child and pretending that the whole world was bigger or I smaller. The concrete, rebar, and fence-wire lend it (I hope) a sense of statuary permanence. Working in such an ideal environment with so many other dedicated artist was wonderful. I can't remember the last time I was so focused, inspired, and productive. Ben Healy lives and works in Chicago. By day, he is a writer and communication designer at IDEO, a global design firm. By night, he writes fiction, non-fiction and a little poetry, and contributes a monthly column on human behavior to The Atlantic magazine. He has an MFA from the Michener Center for Writers at the University of Texas, Austin. I used my time at the Farm to work my way out of a deep and multi-causal writer's block that had been firmly in place for longer than a year. It might not have been any one thing did it, but I know that the quiet, the green, the barn, the food, and, most importantly, the wonderful little community that had sprung up within a week all played their part. I'm so grateful for my time there. Andrew S. Nicholson is the author of A Lamp Brighter than Foxfire (Center for Literary Publishing 2015). He is the Associate Editor at Interim: A Journal of Poetry & Poetics and is an Assistant Professor-in-Residence at the University of Nevada, Las Vegas. His poems have been published in magazines and journals including Colorado Review, Wester Humanities Review, and Bitter Oleander and have been anthologized in New Poetry from the Midwest 2014 (New American Press). He is a former Shaeffer Fellow in Poetry and a former Artist-in-Residence at the Palazzo Rinaldi. He plans to give up poetry to devote himself full time to the more vibrant world of goat chasing. I have had the opportunity to return to the residency a few times. While there I have worked on poetry manuscripts as well as some forays into fiction work. Lara Orr lives, works, and fosters community in Urbana, IL. She also grew up there, so her roots are pretty strong in that prairie town. Her current body of work explores two diverse directions. With textiles she favors techniques that celebrate the hand. She makes prints from hand-carved or hand-build stamps and custom-mixed colors, printed on sustainability sourced fabric. She gravitates towards milled fibers like hemp, linen, and organic cottons. Her work on paper captures a more personal representation of making. She works with a diverse range of materials: ink, collage, thread, and rich, saturated color. Inspiration and content come from her daily rhythm, surroundings, and recordings of lived experiences. Follow her here. Kat and Theresa were brave and let me participate as a visual artist the first year of the residency. They knew this meant I would need access to water, larger floor space, and the ability to make a mess. However, what they afforded me was my first opportunity at a residency, to gain experience working for long stretches of time without interruption, and really dig into process. I will always look back at this experience with gratitude and excitement when I reflect on the trajectory of work after my time there. Oscar Oswald a Black Mountain PhD Fellow at the University of Nevada Las Vegas, where he is completing a degree in English and Creative Writing. He is also the Poetry Editor of Witness. His poetry has appeared in the journals Colorado Review, Denver Quarterly, Lana Turner, Laurel Review, New American Writing, and Volt, among others. At the residency I worked on poetry and compassion. Spencer is a writer who lives and works in Oakland, California. He writes fiction, mostly the long variety, but some short too, and holds an MA in Creative Writing from San Francisco State University. He is inspired by the idea that fiction allows us deeply personal access to things that are or seem completely unavailable to us for all the variety of messy reasons being human provides. We can see the traumatic without being traumatized, love invisible things that vastly expand our capacity to love everything, and understand the perspective of people we never will meet or see. He hopes to get good enough at it to be able to say he lived up to that inspiration. Mostly novels, or pieces of them. One year, I was able to complete 1/2 of a decent draft of a novel during the week. Regardless, I have been with the Residency since it began, and at the end of each week, I've been able to say that the work I did there was the richest all year. The space, and the people that Kat and Theresa bring together to inhabit that space, feel completely dedicated to the creative process...whatever that means to you. I leave the farm rejuvenated and with work that I can refine and share with the world happily. Violist Jay Pike has performed with many ensembles in the Chicago area including Chicago Opera Theatre, the Elgin Symphony, Chicago Chamber Orchestra, and Ensemble Dal Niente. He studied viola in his home state at the University of Montana, and completed a Masters degree at the Chicago College or Performing Arts. Jay also keeps a busy teaching schedule. In addition to running a Suzuki violin program in Morton Grove, Jay also teaches for community music programs at Merit School of Music and The People’s Music School. I had lots of productive time at the residency, as well as lots of inspiration. I worked on several pieces in preparation for a recital. Patricia Reynoso was born and raised in California. She is the winner of the 2015 Highsmith Playwriting award and the 2014 Yeah, I Said Feminist playwriting award. She studied playwriting and received her MFA from San Francisco State University in 2015. The farm provided me a bucolic space filled with peace and tranquility that I very much needed to get over 30 pages of writing. The daily lunches and dinners really allowed all of us attending to bond and support each other to create our art. Also, during that time I was pushing myself to face my fears. I learned to be vulnerable and also faced those spiders and insects looking down at me through the mesh of my tent. My time on the farm will always be very precious. 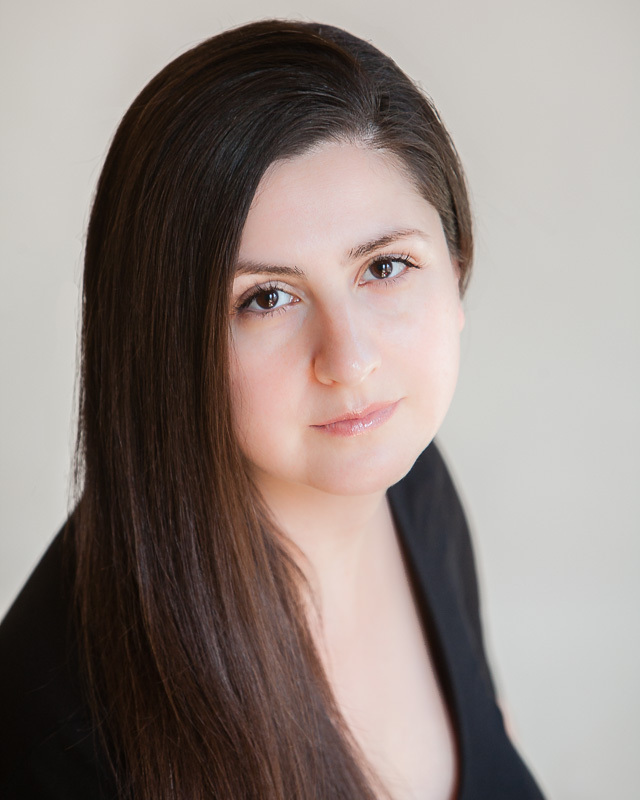 Jennifer Lynne Roberts is a Bay Area playwright, producer, Brady Fellow and Associate Artist with 3Girls Theatre. She earned her MFA in Creative Writing from California College of Arts. She is Co-Founder of Ex Nihilo Theater, Producer for ReproRights! Theater and member of The Dramatist Guild of America. She was Head Writer for 3GT Investigates: Birth Rights, for 3Girls Theatre, 2018. Two short plays, Factory Farm: A Documentary and It Farcely Seems Possible, are part of the production ReproRights! Presented by B8 Theatre in Concord CA. October, 2018. Her full length play, The Killing Jar, is slated for production with Spare Stage in 2018. Commissions include: Death of a River in 3/4 Time for the San Francisco Olympians Festival V: Monster Ball, 2014; To the Light Alive for SF Olympians VI, 2015; ELEMENTS OF BEING A MASCOT for All Terrain Theater's Women in Solodarity, 2015; Repo Rights! Women@Risk in collaboration with 3Girls Theatre Company; Cowboy Noir: Tall Tales of the Unnatural for Pacific Play Company, 2015; Zero Hour: The Mars Experiment and I Saw It, 2015. During my time on the farm, I worked on restructuring my full-length play, Bliss Point, which is about food, farming, women, war, class, privatized prisons, race, guerrilla gardening, Women's Land Army, patriotism, and being forcibly fed. Having time to focus entirely on my creative work allowed me to discover new things about the play and come to important realizations, particularly and surprisingly, about whose play it actually was. The epiphany has opened the play up and made rewrites come together more smoothly. I also learned I love writing in barns! Sarah Roots is a writer from Chicago, IL. Her interests include writing about birds and nature, and she is currently working on her first mystery novel. You can read some of her work here. The residency provided an abundance of peace, beauty, and delicious food to support us during our work. I was able to dream and strategize about my writing, and was inspired by other artists to try new ideas. Arvin Temkar is a writer in San Francisco. His essays and journalism have appeared in The Washington Post, Boston Globe Magazine, Poets & Writers, and other publications. At the farm I worked on a few essays in preparation for starting an MFA program in creative writing, made new friends, learned about farm animals, and enjoyed being out in the country. Monica Villavicencio is a one-time journalist turned fiction writer and video-maker living in San Francisco, CA. Her stories explore the immigrant experience, class issues, and faith and have been published in the Blue Lake Review and Cosmonauts Avenue (forthcoming). She Is participating in AWP's Writer to Writer mentorship program and is a yoga teacher-in-training. At the residency I worked on a novel. I was able to write a lot as well as do lots of inspiring reading. Stacey Winn is a writer and actor based in Oakland, California. Her plays and poetry have appeared at the San Francisco Olympians Festival, the ShortLived theater competition, and in Vinyl Poetry and Prose. Her nonfiction and ghostwritten works have been published by the National Cyber Security Alliance, ITProPortal, and Tech Week Europe. While I was at the residency I practiced audition monologues, revised a short play, and worked on other pieces. Find out about the people behind the scenes at Residency on the Farm here.